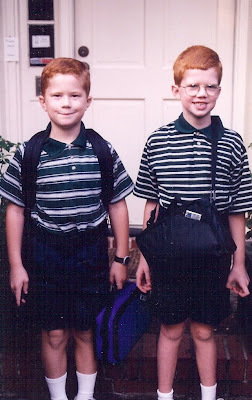 My boys all started school yesterday. After moving into the dorm and going on class trips last week, yesterday was the big day. The boys quietly and calmly went about their business. I guess I'll always think of them as "the boys," even though they're young men now. No big production--just back to school. I wish I were the scrapbooking kind of mom, the kind of mom who would always take pictures to remember such special things as the first day of each school year. I'm afraid I'm not organized enough for that. But I was happy this past week to be reminded of a special little fact. Turns out that the very first friend that my oldest son ever made in school, many years ago and in another city and state, has now become a friend again. That little boy we used to know now lives in the same dorm at Duke as my son. Now, eleven years later, those boys' paths have crossed again. Isn't that cool? So I'm reminded that, although I may not be a scrapbooking kind of mom, God is a storytelling kind of God. He is telling me the story of His goodness and kindness and everlasting faithfulness, the way He takes care of us and provides for all our needs. And He is gently urging me to remember that He always will. I'm grateful to be back to school with a very patient Teacher. How sweet is that :-) and what a cute picture. What a sweet post. I am not organized either and don't scrapbook. I remember my kids going off to college. Oh what a great read! Just a wonderful reminder God is @ work. "although I may not be a scrapbooking kind of mom, God is a storytelling kind of God. He is telling me the story of His goodness and kindness and everlasting faithfulness, the way He takes care of us and provides for all our needs. And He is gently urging me to remember that He always will." this caught my heart and squeezed the tears right out onto my face. and not those pretty tears either... the big gloppy kind that make your heart just ache with love. and... what a wonderful way to start the new school year... with a friend! Such a small world! Great story. What a great story! So cool that they've been reunited. that's awesome. isn't our God amazing how He can twist and turn our paths in such neat ways? love that pic, btw. such darlin red heads!! I love when I recognize the reminders! They are around us every day: in nature, in people, in posts like yours! Thank you for helping us simply remember. I do love happy endings, and God is the master of such. Love the pic of your son and his friend. Our children leave us so soon, don't they? Love friend stories that span over the years. No contact and then, boom. That's such a cute picture. And I'm thankful for the very same patient teacher. God is writing a story we can't always see...what a great reminder of this. how cool for your son! Found you via "Chatting" and *love* this post. Thanks for sharing! What a wonderful Lord to care about our lives and orchestrate events such as this to bless us. What a neat story! Small world. Best wishes for your family as you begin a new season of life. I am constantly amazed at how God puts people in and out of lives. God had His hand in those boys being together again at Duke. How awesome! Loved the picture of the young boys. So handsome! Best of luck to your son and his friend, in college at Duke. Love & blessings from NC! What a sweet picture! It's great that your son and his old friend have reconnected. 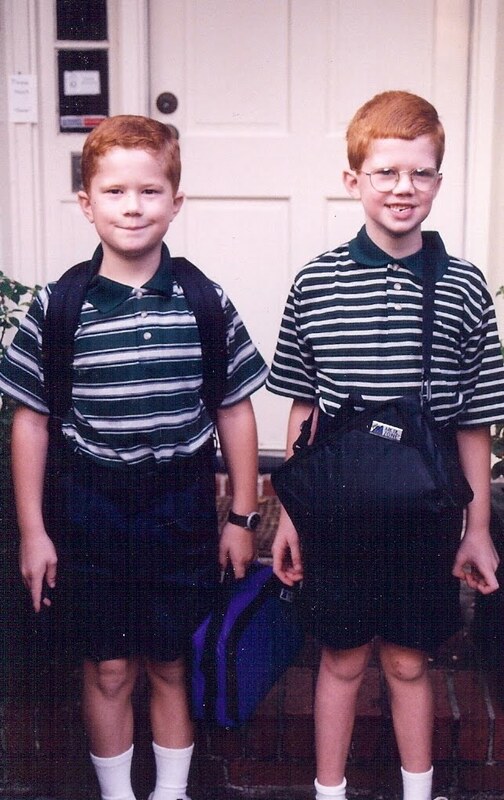 Today was my first visit, and I just found the picture of your two redheads. I love it! I call my four "the boys" too. Guess I will, no matter how old they are!